There is a season for everything, or so it goes. I wait all winter long for the sight of the first spring bulbs, breathe deeply when warm spring air assures all chance of frost is past, gladly rise early when robins sing at day-break, and soon enough look forward to crisp fall days when we tear down the vegetable garden and put perennials to bed under a blanket of mulch. The continuity of common occurrences is vastly reassuring, and it seems there is a time and place for everything in the garden. I rely on strawberries in June, veggies in summer, and apples and pumpkins in fall. 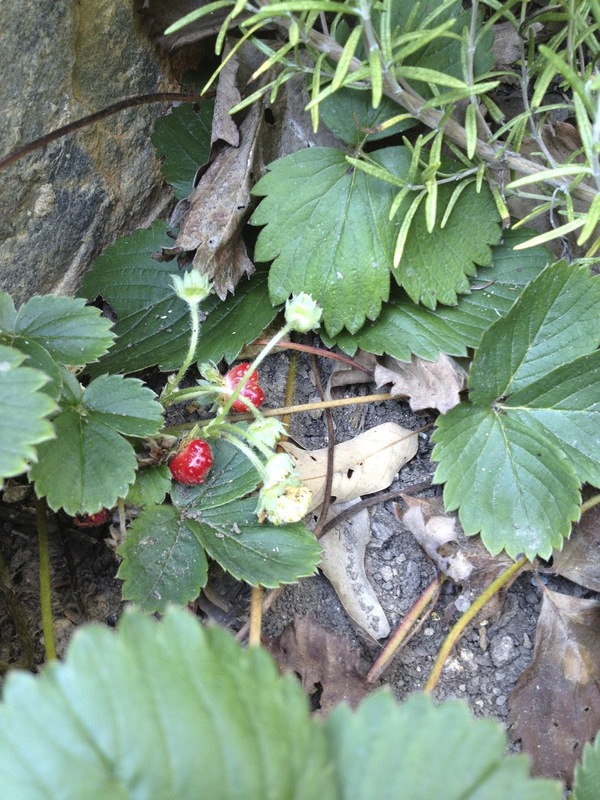 So it was with some surprise and trepidation that I approached the ripe strawberries struggling to surface from the dead foliage in my herb garden in mid-September. Of course, I planted them; but of course, I forgot about them. There are two types of strawberries that grow in our area: June bearing and everbearing. Everbearing send out fewer runners and produce from late-spring through fall. Both varieties need full-sun and consistent moisture. I use the cultivar 'Tribute' as a border in the raised-bed herb garden. 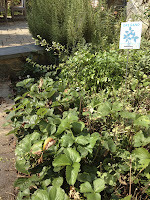 By pruning runners and stray plants, I'm able to maintain a lush, green border with pretty white flowers and abundant fruit in spring and late summer. Early in the year, I cover the strawberries with netting to protect them from birds and squirrels. Thought I stake the netting, squirrels are adept at removing it, and then it's just a wildlife feast to which I am not invited. By mid-summer, when the first flush of berries is done, I give up on the netting and focus on that month's most pressing garden needs. 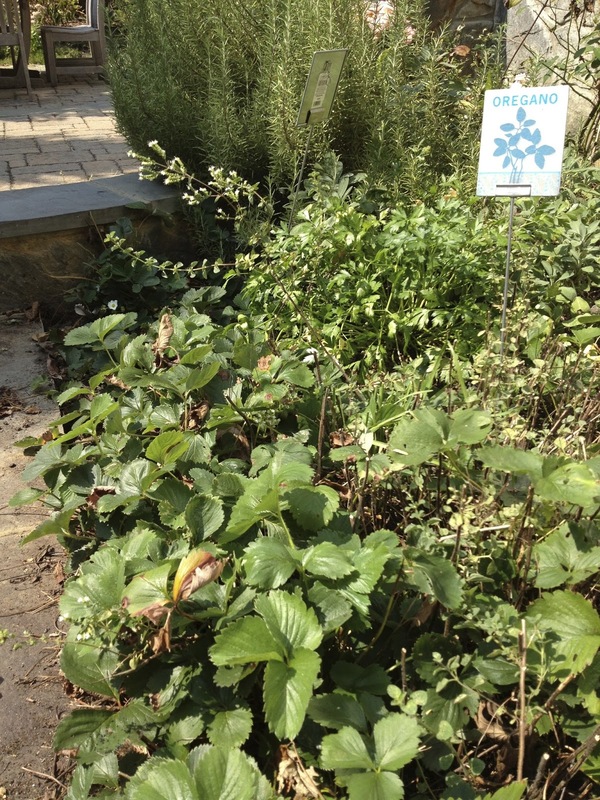 The squirrels and birds also move on to more abundant food sources, and the strawberries are left alone to regenerate. Parsley and oregano claimed a banner season, soon overshadowing the strawberries plants. 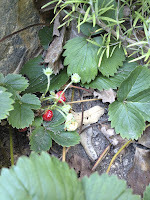 Had I been thinking about the berries and giving them the attention they deserve, I would have fed them with some compost tea every few weeks throughout summer. We were fortunate to have plenty of rain, and they didn't suffer from the heat. Normally, straw mulch will help the soil retain even moisture. I don't grow many delicate plants at this stage in my life. There are simply too many other living things, indoors and out, that need nurturing. Thank goodness I had the forethought to plant ever-bearing 'Tribute' - a tribute to the unlikely pleasure of ripe red berries in September, and to the fact that even with a little neglect here and there, life goes on.